Howdy! In today's Pets 'n' Stuff post I am going to be talking about Rue's favourite things. For those of you that aren't aware, Rue is my Syrian Hamster. She's a tort, short haired, pet store hamster and she's approximately just over five months old. From day one she had such a lovely temperament. She's not once bitten me in an aggressive way, but sometimes she'll nibble or even lick my hand. I'd never had a licky hamster before her. At first she was very fast and spent a lot of time trying to scale down my body, once even making it to the floor. However, as she's gotten older she's slowed down quite a bit. She also sleeps a lot more and a lot later. Now, just a little bit of a disclaimer. This is what Rue likes. Every hamster is different. With that in mind, on with the list! I've phrased the title above as such as Rue loves toilet roll and also the toilet roll cardboard tubes. Stores do all different types of bedding for hamsters. Shredded paper, shredded tissue and even on occasion the highly dangerous and should be banned fluffy cotton bedding. I beg of you, if you have this type of bedding for your hamster please remove it immediately. It has been known to cause obstructions inside hamsters when swallowed and also to wrap around legs, cutting off circulation to the limb. But I digress, there is really no need to purchase bedding at all. For Rue I shred some sheets of our toilet roll from the bathroom and scatter it around her cage. She then goes around collecting it and takes it back to her nest box. It doubles as something for her to do and it's also great and safe nesting material. Even when her nest is made, every now and then I'll tear up some and spread it around and she'll go around and add it too. I'll do it once a week or so. Here you can see some of the strips or toilet roll. You may also be able to make out that Rue has her cheeks stuffed full of it! As I mentioned, Rue also likes the cardboard tubes from finished toilet rolls. These can double as something to chew and a little tunnel for her. Just remember, if you have a Syrian Hamster or a particularly big or fat dwarf etc, to cut down the length of the tube as there's a chance they might get stuck. Nobody wants that! Something I did recently was putting in an almost finished toilet roll, still cutting down the length of it. Rue really enjoyed tearing bits off until she got down to the cardboard. All round it's a cheap and effective way of keeping my little cutie entertained! Rue has a savoury tooth like her mum. I mean she likes sweet treats and fruit on occasion but when I give her a fruit and vege salad, her go to is the leafy greens or the greens in general. Opting for the fruit last, she'll even leave some of it on occasion. Her favourites are rocket or romaine lettuce, cabbage and broccoli. She also loves cucumber. As with all fruit and vege it's important to introduce these things slowly to your hamsters diet and not give them too much as it can cause diarrhoea. Rue seems to eat her fresh food right away, so I never have trouble with having to clean out fresh food from her hoards, but that's something you should keep an eye on. I usually give Rue a salad every other day and that seems to work for her. It's not always leafy greens though. I mix it up. If you have a hamster other than a Syrian be aware that other species cannot have too much sugary fruit as they are prone to diabetes. If - like me - you're obsessed with treating your hamster and frequent the small animal treat isle in the pet store very often, you may have come across these. They're basically dried out corn on the cobs. They usually have a plastic hook on them so you can attach them to the side of your cage. I think they're basically marketed towards all critters. 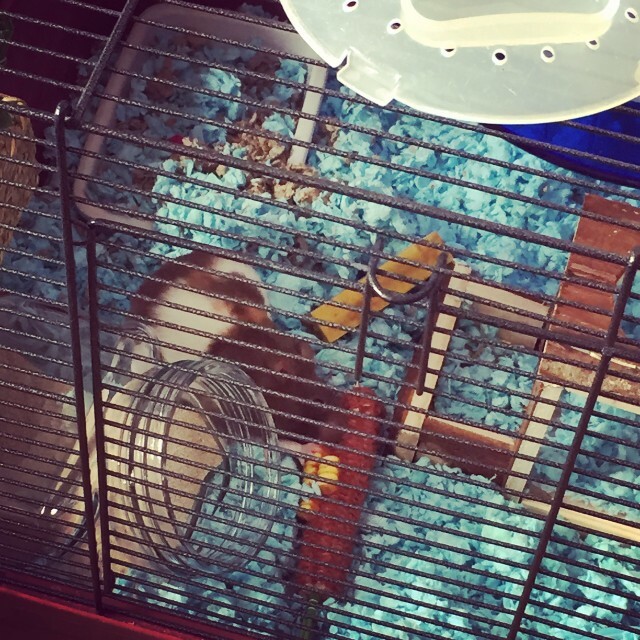 Both Rue and my sister's hamster Ernie love them. I mean LOVE them. Rue will spend ages pulling each piece of corn off the cob, putting them in her cheek pouch. Then she'll go and empty them all out into her hoard in her nest. I honestly think she enjoys plucking them off more than actually eating them as I'll often find them still in her nest during clean out. Here you can see Rue finishing off one of the cobs. 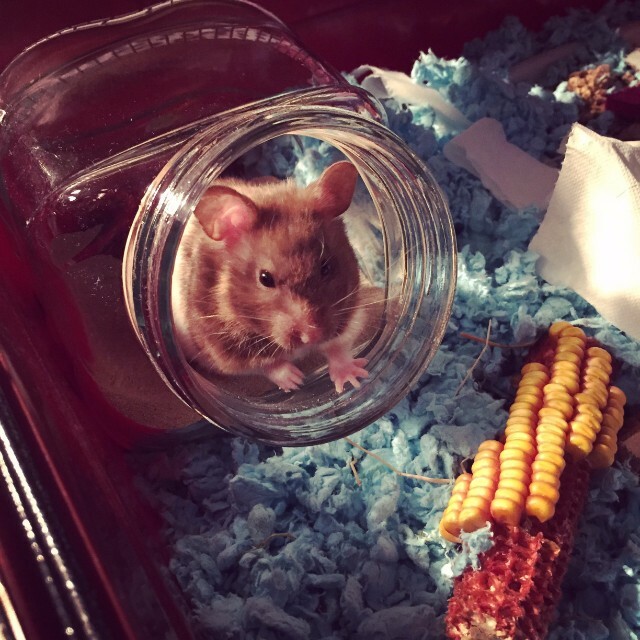 Despite having many hamsters in the past and as a child, I've learned so much having Rue. I guess since I'm an adult now I've made it my business too. There are so many resources out there to learn, there's really no excuse. That's why I urge people to soak up all the knowledge they can before they get a pet to make sure they don't make the same mistakes I have in the past through sheer ignorance. Anyway! During my knowledge hunting I found that many hamsters love sand baths. They'll dig in it, groom in it and some will even use it as a toilet. Something Rue is guilty of. 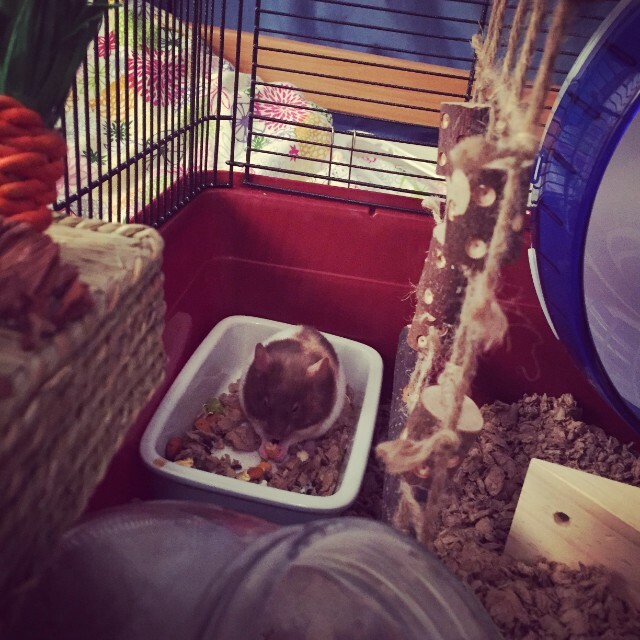 Rue's sand bath is a cookie jar I got from IKEA with the lid screwed off. She had another cookie jar one from Tesco but I found it was too rounded and more shallow, which let her kick the sand out a lot more. The one from IKEA is more angular and deep. Rue peeking out her sand bath. For a sand bath you can use chinchilla sand but NOT chinchilla dust. Buying sand from the pet store, as I do, means it's already pet safe. An alternative is children's 'play sand but you must clean it first to make sure you don't introduce anything potentially harmful to your little cutie. I believe you can do this by putting boiling water into it and then letting it air dry or then baking it. You can get children's play sand in larger quantities and for much cheaper but I've found it's difficult to get during the colder months. However, a big bag would last a long time but you do need to clean it out regularly. Especially if your hamster likes to pee in it like Rue does. I find her cage only needs cleaned out once a month but her sand bath needs cleaned out a lot more regularly. 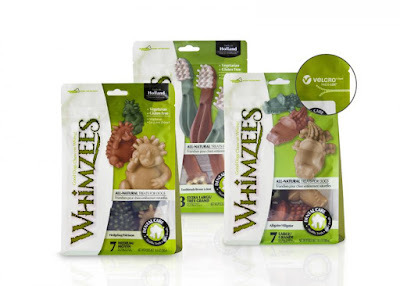 If you have a dog you may or may not be familiar with Whimzees chews. They're marketed towards dogs and are the cute chews that come as a tooth brush, hedgehog or crocodile. They come in different sizes and you can either buy them singularly or in a pack. Rue loves these. I get her the small size and they last quite a while for her. She kept her first tooth brush one in her bed with her but the crocodile was a little bit bigger so she took it into the box hoard beside her bed. It's kind of amusing how organised she is. Anyway, these are a great addition to your hamster cage. Especially if your hamster is a chewer. 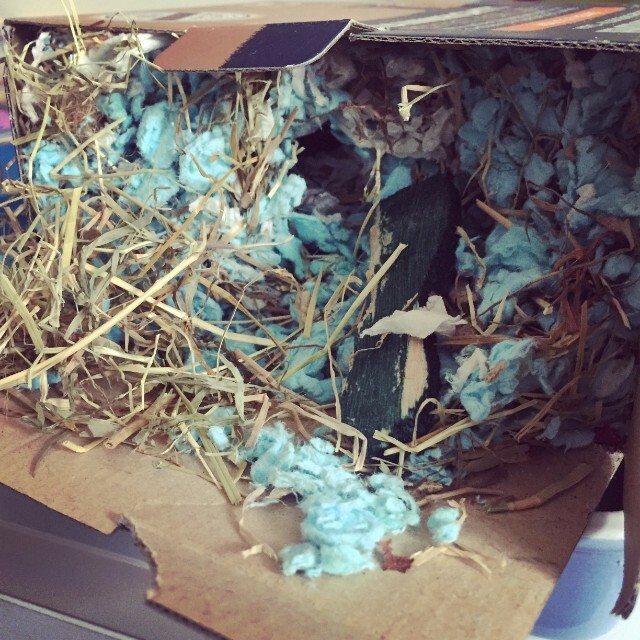 Rue doesn't have a nice little house like some hamsters have. Much like tossing her shredded toilet paper around and letting her collect it up to make her nest rather than putting it into her bed for her, I like to give Rue a project. Rue won't just run in her wheel all day. Rue needs more stimulation than that or else she'll turn to bar chewing. She bar chews a lot less than when she was younger but I still have to make sure she has things to do. So a house she can modify is great for her and interesting for me too. She makes awesome nests and I love seeing the different doorways and such she adds to it. Once she chewed out the whole bottom of the box but it still sat up perfectly like a house. She had an entrance at the front and at the back where she would access a wooden magazine stand, I have tipped on it's side, which she uses as a hoard. I also sometimes add other boxes into her cage as something to chew or to make a hoard. It's something cheap that they'll enjoy that you're probably going to throw away anyway. Rue LOVES her hoards. 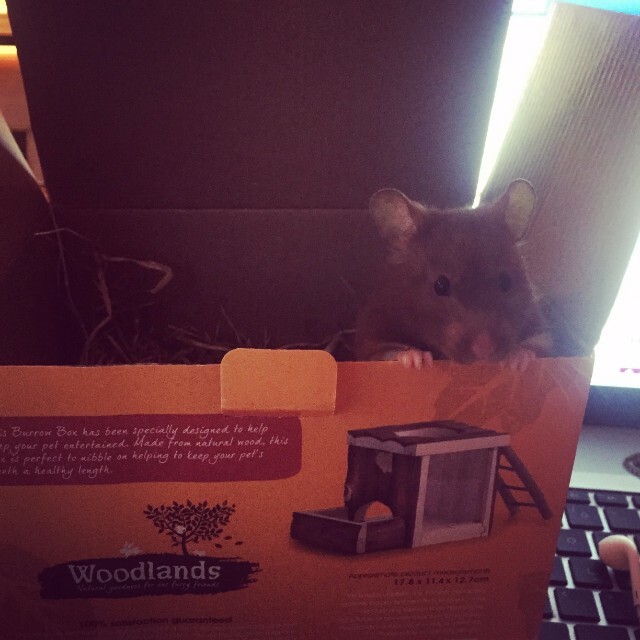 Now, this isn't really something you can do for your hamster but if Rue could recommend something to your hamster she would recommend they take up this pass time. Rue has multiple hoards in her cage. I'm quite lucky she doesn't keep fresh food in them as it would be a nightmare cleaning them out every day and she isn't too happy when I mess them up on her. A girl needs her privacy. I can relate. Nothing worse than going to find something and it ain't where you left it. I realised just how habitual she was with her hoards recently when I moved one that I thought was no longer in use. Her first hoard in fact. Rue in her first hoard. Rue's first hoard was a bowl I had intended to be her sand bath. I put it into her cage before the sand arrived and she quickly filled it with substrate, followed by bits of food. I never emptied it during clean outs. I'd simply clean it up a bit (meaning I'd wash off any pee and remove any food that was particularly soiled) and put it back. It's important you don't disturb nests or hoards too much, particularly during cleaning out the cage as going into a fully cleaned out cage can be highly stressful. If you need to change the bedding or completely clean out a hoard, you're best to do that a week or so after cleaning out the rest of the cage. Same with cleaning toys etc. But I digress, over time the bowl got more and more substrate in it. To the point you could no longer see it. I also noticed she was using other hoards more and there didn't seem to be much food at all in her original one. So I decided to change things up a little, I would remove it and put a cardboard box in it's space. Don't get me wrong, she enjoyed the box but she was not happy I'd removed the hoard. She started digging under the box to find the hoard and then moved the box completely. My poor little lady looked so confused as to where her hoard had gone. She also recently started using her salad bowl as a hoard. I put her salad in one night and the next morning it was topped up with hamster food, yogart drops and dog biscuits. It looked as if someone had filled it for her. I actually asked my sister if she had. It's a little odd since up until recently her hoards where on the most part hidden. I can't tell if it's an actual hoard or she's telling me she's done with whatever's in the bowl and she wants it removed! Hamster balls are widely debated within the hamster community and as far as far as I'm aware the RSPCA doesn't recommend their use. There are concerns over nipped or caught hamster toes, overheating and some hamsters have also escaped them. However, I personally I think you have to work on a hamster to hamster basis. Rue loves hers and she would spend hours in it if I let her. She's a very relaxed hamster and she's not phased by us or my other pets. So even when she's in her ball they don't bother her. If anything, she bothers them. I also tape the openings closed so she can't escape as I've read of hamsters actually learning to open their balls themselves. As I said though, balls aren't for every hamster. If your hamster is particularly skittish then maybe it's not a good idea. It's important to know your hamster. Rue has always been very good at telling me what she does and doesn't like. Right from the beginning when they put her in the cardboard box for me to bring her home and she spent the whole journey home screaming. I thought I would do eight things Rue recommends and two she doesn't to bring the list up to a total of ten! So here are two things Rue does not recommend. A few times a week I was scatter feed Rue, meaning I'll toss some food and treats around her cage. Again, this just gives her something to do. She can root around, collect it and put it in one of her hoards. Sometimes, by accident, a piece of two will end up in her wheel. She has a 12 inch Silent Spinner which she spends a lot of the night on. However, if there's even one grain of food in it she refuses to use it and will bar chew all night instead. I don't know if it's the noise of it or perhaps it hits her when it spins around but either way it's enough to put her off running in the wheel until it's been removed. 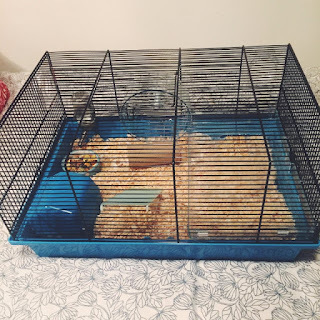 When I got Rue I bought the cage to the right. I knew when I bought it I was only buying it as a temporary cage until I could get her a better one. I mentioned this to the shop assistant and she assured me this one would be quite all right for the duration of her life. As you can see from the picture there is barely enough room for her to have any stimulation at all. She was already too big for the wheel and it had to be promptly removed. The little house was also tiny and she'd soon outgrow it too. Since there was basically nothing for her to do she ended up bar chewing constantly. It was hard to watch. If you get a Syrian hamster you need to take into account they're going to most likely need at least an 10 inch wheel. Rue has a 12 inch one. Anything smaller for a Syrian will give them back problems. Up until recently my local pet stores didn't do any cages that came close to a suitable hamster sized cage. A couple of weeks ago I seen they do now have one in stock but why they still stock anything smaller and tell people that their hamster will be perfectly happy in a cage of this size is beyond me. Depending on where you live there are different minimum requirements for cage sizes. This is a great video to watch on the different minimum size requirements. Rue didn't have to spend very long at all in the tiny cage as I was able to order her one that was a good size online and it arrived pretty fast. I opted for the Alaska cage and ordered it from Zooplus after watching some cage tours and reading reviews. It's 84 x 48.5 x 44 cm in size and although it felt massive when it arrived, once I had all Rue's things and Rue herself in it it really didn't seem that big at all. 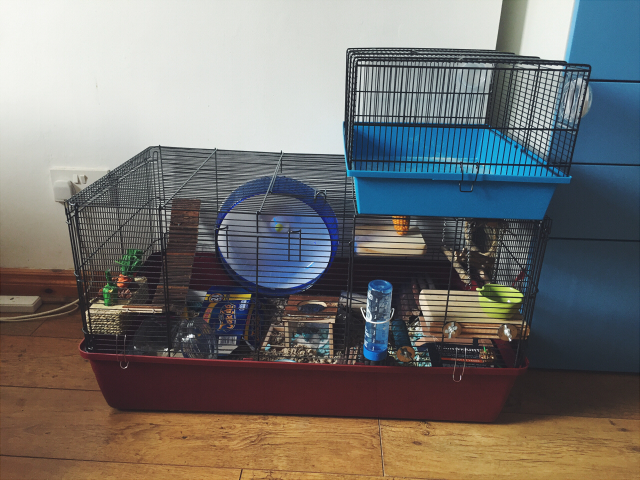 It's definitely the minimum I would have and I plan to get a bigger cage when I move out and have more space. Hamsters prefer floor space to height, which is something else to remember when you're purchasing your cage as tall multi level cages are very popular. 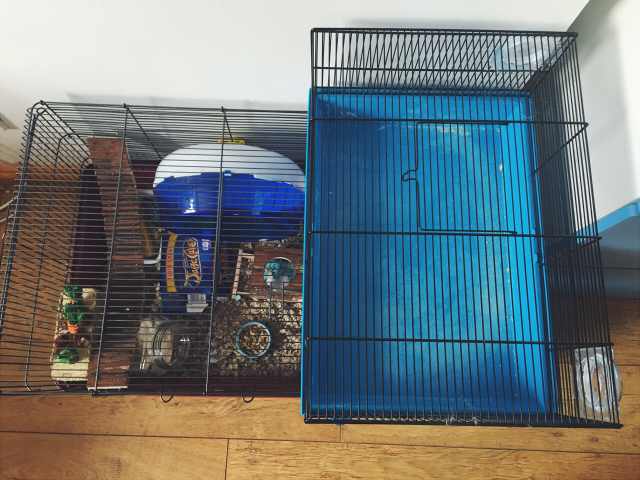 Above, you can see the size difference in the cage I got from Pets At Home and the Alaska cage. The Pets At Home cage cost me £25 and the Alaska cost me £37. Another reason why it's good to shop around online. A cage of a similar size in Pets At Home is priced at £70 something. The Alaska cage also has a deep tray so you can have substrate deeper for digging. Which a lot of hamsters like. It also has a big door on the top and on the front, which is easy access to put in toys and such as well as getting Rue out. Like I said though, this cage size is the minimum I would have. Rue still needs of plenty of time out of the cage to exercise. I've had people tell me they don't need a big cage for their hamster because their hamster is small or because they get it out plenty. People have also said that their hamsters feel safer in smaller cages. This is just... wrong. 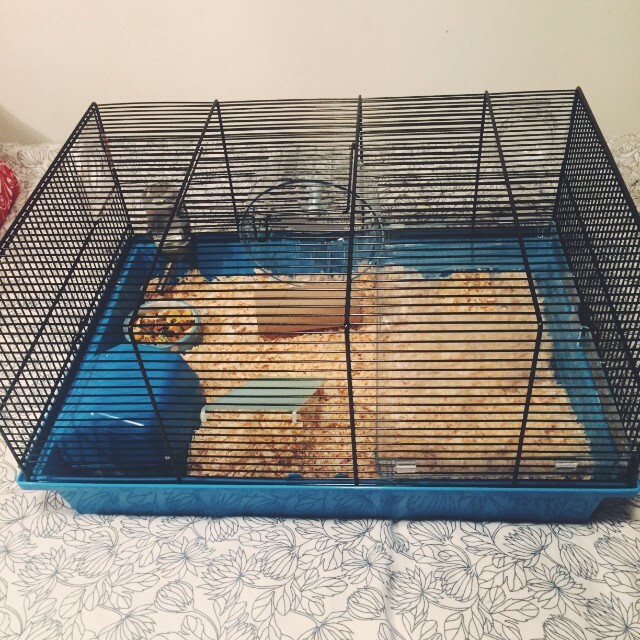 Even the smallest species of hamster need the biggest cage you can comfortably afford and have space for. Hamsters are most active at dawn and dusk. 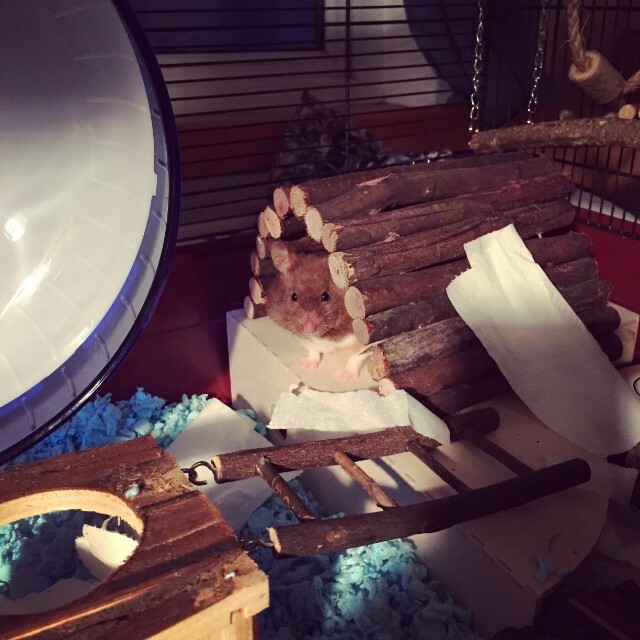 So unless you plan to be up while your hamster is and give it all the stimulation outside the cage that it needs, not just exercise, then you're going to need a big cage. Lastly, it's true hamsters can feel frightened in big open spaces. That doesn't mean they need a small cage. That means you need to make sure there are plenty of hides within their big cage. Rue has her sand bath, digging box, twig bridge hides and her nest in her cage right now. Some double as things for her to chew as well as somewhere to hide or keep hoards. So yes, when it comes to hamster cages the rule of thumb is always, bigger is better. So there you have it. Some of the top things Rue recommends and a couple of things she doesn't! As I mentioned, some of these won't apply to every hamster but some of them do. Part of fun owning pets is working out their likes and dislikes. If you have a hamster please tell me in the comments if they share any of Rue's likes or suggest something I might not have tried with Rue and I'll see if she shares your hamster's likes!